Get your loved one appropriate care. How do you do this? You ask experts. 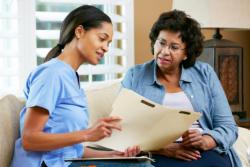 Our Consultant Services are provided by social workers who have the experience and education to guide you in choosing the right set of care programs. These care programs will be delivered to your home and will be personalized according to your needs. For us to better respond to your care requirements at home, we encourage clients to set an appointment with a social worker or care coordinator from our staff. A consultation will be scheduled enabling you and your loved one to ask questions and bring forward concerns about your health.